Spent the day in the garden yesterday and paid for it today with a very sore back! It was a beautiful day too. It didn’t stop me from going to the gym though, back on track with some gardening tomorrow. I think we can finally say we are getting some real summer weather here in Burlington, high 20’s (Celsius) and sunny. Packing the trailer again for an upcoming weekend trip with Philips brother. 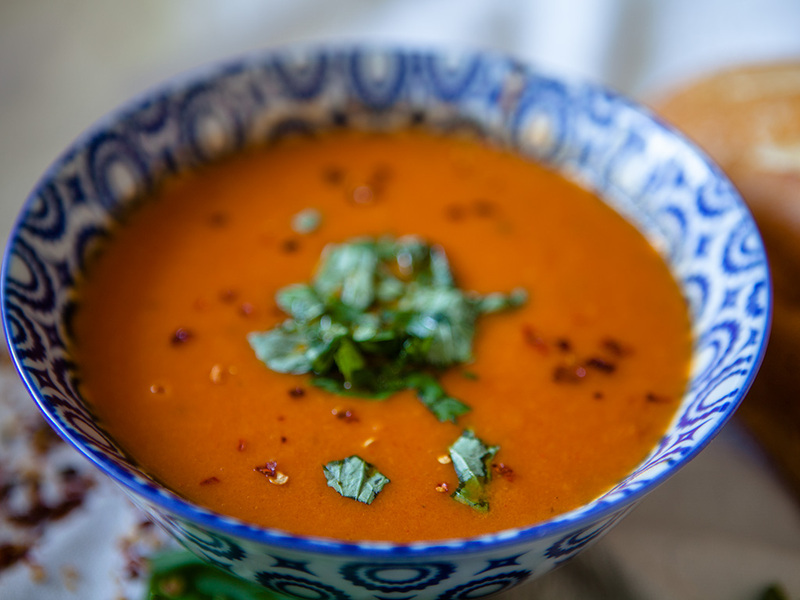 I wasn’t very motivated in the kitchen today so I made this quick and tasty curried tomato soup, boy was it delicious. 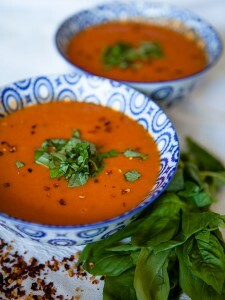 Very simple to make with some great ingredients like canned tomatoes, Thai curry paste, coconut milk and fresh basil. Philip always likes crusty bread with his soups, we buy it from a local bakery which has vegan breads. I love to serve this soup topped with fresh basil and crushed red pepper flakes. Heat up olive oil. Add onion and sauté till onions turn translucent. Add garlic and sauté for one more minute or so. Add tomatoes, coconut milk, veggie broth and Thai red curry paste to the pot then bring to a boil. Reduce heat, cover, and simmer for 15 minutes. 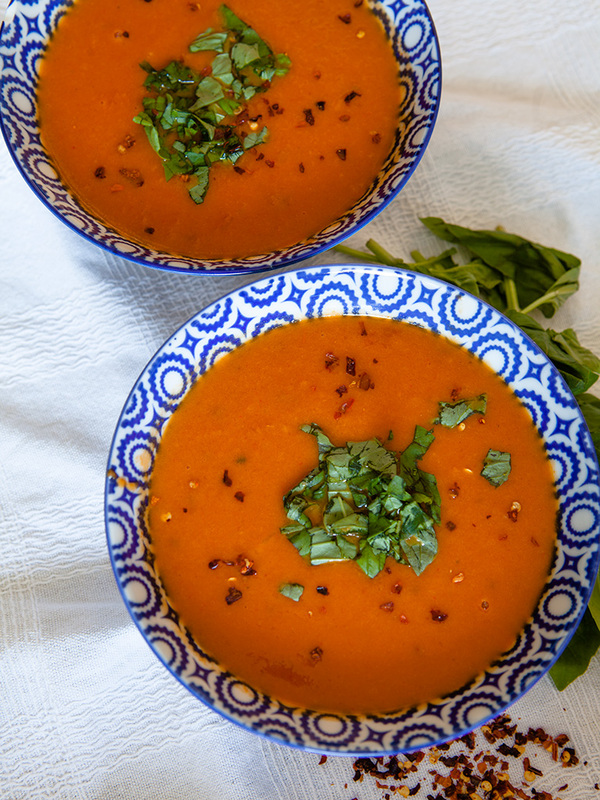 Puree in small batches in a Vitamix or blender till completely smooth. You want a nice creamy soup. 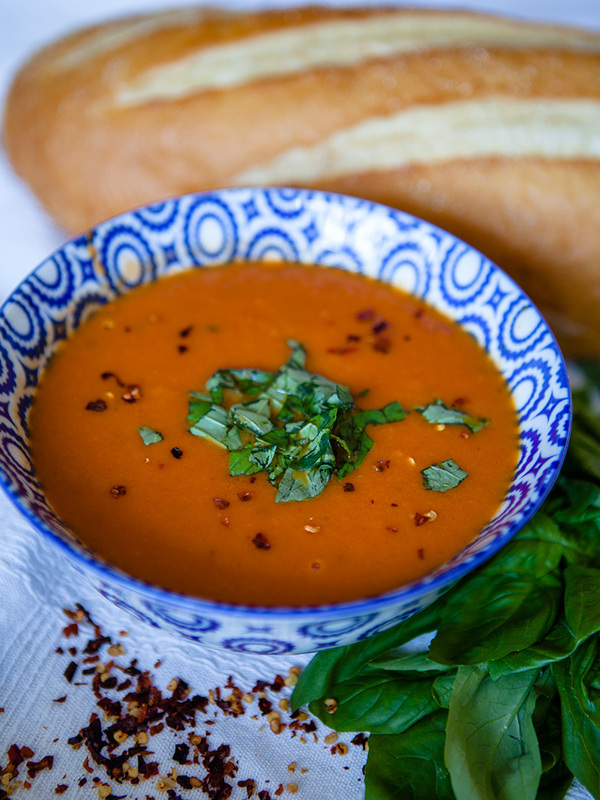 Serve with fresh chopped basil and crushed red pepper flakes.